It's been a hot summer so far. Like Plains of La Mancha Hot. And I need something cool. Easy. Relaxed. Juicy. Fortunately my love affair with all things Spanish can get us through this hot flash. Saffron. Tapas. Paella. Penelope Cruz. Wine. These wonderful (and mostly) culinary elements support a lifestyle in Spain I categorize as "graceful living". Spaniards are beautiful people (note from wife - Javier Bardem) with a special culture and way of life I hope becomes better understood and appreciated in the United States. And when it gets hot the Spanish know how to maintain their cool. A walk through the patio of the soaring Cathedral at Sevilla. The shade and smell of orange trees intertwined in a warm breeze. Nibbling on inventively light tapas at San Sebastian's seaside. Overlooking the Mediterranean from Barcelona's glorious Parc Guell. Such Spanish coolness comes alive in an icy glass of Sangria. A pleasant way of drinking and living in these hot summer months. There are many translations of Sangria that speak of how to make it. 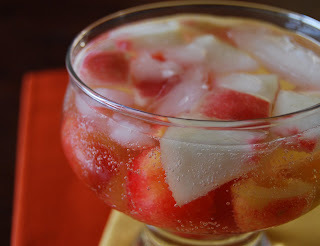 The basic principle is to marinate different fruits, typically citrus, in wine for several hours and then mix it with sugar and sparkling water. Sangria is very food friendly and pairs well with BBQ, spicy foods and uncomplicated preparations. It also stands by itself and can be fully enjoyed without the need for any supporting actors...although we can still pour Señorita Cruz and Señor Bardem a glass. While many will argue that red wine is used for traditional sangria, in this day and age those traditions don't mean much. I love the platform sangria offers for innovation and often use excellent regional Spanish white wines, including Galician Albarino and Verdejo from Rueda, to make new types of sangrias. Spain has become ground zero for a global food revolution of innovation led by Ferrán Adriá, Juan Mari Arzak, and even the Guggenheim Museum in Bilbao. Their inspiration and passion against the backdrop of Spain has influenced and inspired me to develop this updated, yet simple recipe. In a large pitcher combine the wine, peaches, cherries, Cointreau and sugar. Mix well and refrigerate for 4 to 6 hours. Fill a glass with ice cubes and pour in the sangria and a few pieces of each of the macerated fruits. The glass should be 2/3 full. Top off with club soda and mix gently. Note that virtually any fruit can be used in Sangria. If you can't find white peaches, yellow ones also work well. The Rainier Cherry has a short season (May to July) but regular Bing cherries can be substituted or you can use raspberries or strawberries. No matter what fruit you select, make sure it is ripe as this drink is only as good as the sweetness the fruit imparts. Also, if you can't find a Spanish white wine, a crisp California Sauvignon Blanc works well in this recipe. I love sangria on a hot summer day. I love sangria on a not so hot summer day. I wish I had a pitcher of it in my refrigerator now. You and I share similar tastes (sangria) and interests (wanting to write a cookbook). Finally a Sangria recipe that stands out. I'm not always a fan of the refresher, but a few weeks back, I smoked some fresh trout that a generous neighbor shared. I'm guessing that your Peach & Cherry Sangria would go well with a second round of the smoked rainbow. A menu that includes the two is in the works. That looks great Marc! I love the picture of the fruit plate as well. Thanks Alexa. I actually bought the plate on previous trip to Granada, Spain. More inspiration! Normally I'd be against sangria because they can be so sweet, pure yours looks fresh and only fruit sweet (like Riesling). Thanks for sharing, I've always been into the idea of white sangria. If you ever decide to take a trip out to Minneapolis, drop me a note, I'd e happy to suggest some excellent restaurants. By the way, I'm going to try this sangria recipe; just adore sangria. I have been dreaming of Sangria for 3 days straight...I guess I have no excuse now! First of all, I love a nice refreshing sangria in the summer. I am glad you enjoyed your visit to the Basque Country. It is beautiful, indeed. I will be going home soon too for a short visit. Secondly, thanks for stopping by my blog and leaving such a lovely comment. Thank you very much. You have something wonderful going on here as well! Thanks for the visit to my site! Beautiful post, it reminded me when I used to live in Spain and drink sangria on a daily bases! Yummy! I love your travelogue/food/style writing style! Have you ever tried Agua de Sevilla? if its got liquor, immm in!!! !